Every now and then Yankee release a scent that sends everyone in to a frenzy. Last Easter they released a new sent to their usual small limited edition line. 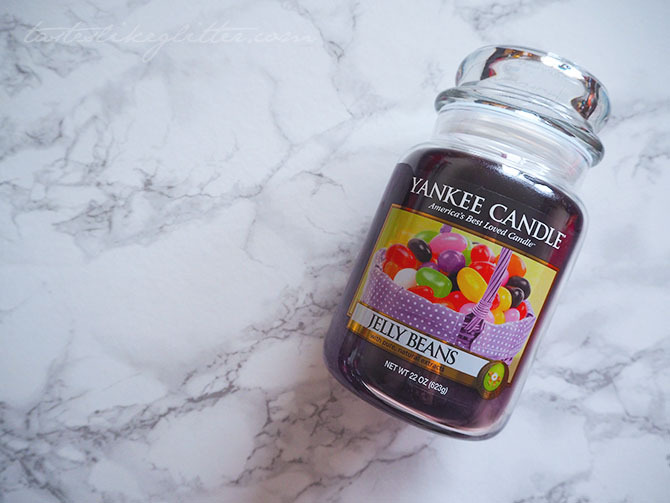 Jelly Beans was released in large jar form only and it seemed to sell out everywhere extremely quickly. So much so that people were selling the large jar for upwards of £40. People have even been selling scrapings to use in a wax burner for £3 a bag. For a tiny scraping of wax? Madness. Well if you're looking to get your hands on it, it's back this year in large jar alongside a votive and wax melt. In 2015 it was marketed as Jelly Beans. In 2016 it seems they've labelled it as Jelly Bean - I'm not sure why the change, it seems somewhat pointless. I was debating whether to burn this because it's stamped with an Easter egg, stating it's a collectors addition. For review purposes I decided to give this a little burn whilst I was working on things for my blog this afternoon. This candle has the most easiest and cleanest burn I've got from a Yankee Candle before. Sometimes I find where the wax is curved in at the top of the jar, it gets a little stubborn on the first burn and refuses to melt but not with this one. As for the scent, it's described as bursting with sugary sweet fruits. In the jar the sweetness is what you notice first but when burning you get more of the fruits coming through. So it's not overpowering with the sugar. It fills my entire bedroom with a wonderful, light fruity scent. If you've been meaning to get your hands on it, don't hesitate as I can't see it hanging around for much longer.